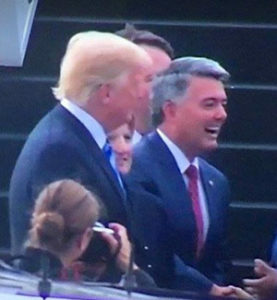 President Trump (left) and Sen. Cory Gardner (R-Yuma). Trump’s announcement Tuesday came just hours after news of a confidential United Nations report that found North Korea is moving its nuclear and ballistic weapons to hide them from potential US military strikes. Make no mistake about it: North Korea still remains a clear and present danger to the safety and security of the American people. So far, no concrete action toward CVID has taken place; decommissioning already destroyed or obsolete facilities does not count. Without concrete steps toward CVID, the only thing Kim Jong Un appears to be committed to is the regime-standard ploy of delay and non-compliance. That assessment is entirely correct as we understand the situation. The question is, why didn’t Gardner say anything about Kim Jong Un being rewarded with another undeserved summit in his glowing sendup of Trump’s State of the Union address? After all, Gardner slammed President Obama for talks with lower level North Korean officials in the absence of “tough preconditions” that have in no way been met even now. Bottom line: Sen. Cory Gardner is chairman of the Senate Foreign Relations Subcommittee on East Asia. His leadership role on relations with North Korea makes this omission more than a mere oversight. For whatever reason, Gardner is unwilling or unable to directly confront Trump over his decisions on North Korea–even as he admits to the problem in other forums. It’s just another example of Gardner trying to appease both Trump and reality, and failing. Nice little economy ya got there. Be a shame if it got trashed because you investigated my treason, money laundering, witness tampering, tax evasion, abuse of power, obstruction of justice…. Cory thinks it will be Infrastructure Week sometime soon.